Fast growing, more so than Princeton Sentry, it is pyramidal with ascending branches becoming half as wide as tall at maturity. It was discovered in New Brunswick New Jersey. Stiffly horizontal, this male is a dwarf shrubby form that grows 3-4 ft. tall x 5-8 ft. wide over 10 years. This male clone grows to 60 ft. tall but only half as wide. With its strong central leader, its form is more pyramidal than truly columnar. One of our favorites, an attractive male selection with distinctly narrow, elongated leaves remiscent of the tail from a fancy gold-fish. Definitely a "top three" selection. 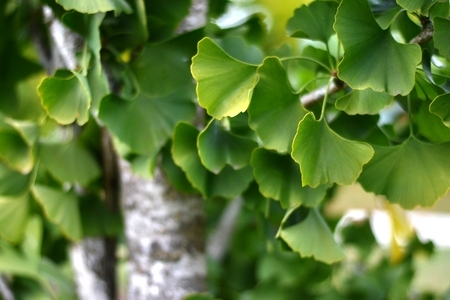 It seems there are several clones going around under this name because there are at least two different dwarf Ginkgo trees at Spring Grove Cemetery in Ohio. We don't know which this is or if it is both; we started with more than one plant. But we do know they are dwarf and very attractive in conical growth habit. Sky Tower™ is going to be popular because of its dense, upright growth. Slow growing, it will reach 20 ft and 6-10 ft wide. and become a great, very low maintenance tree. it is a male selection. 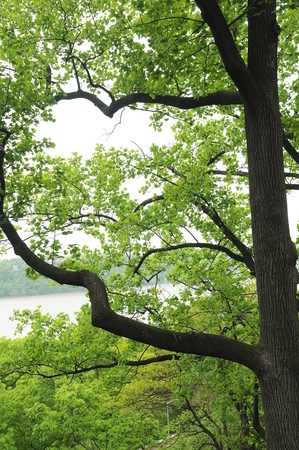 Vigorous, 60-80 ft. tree having abundant, bell-shaped flowers on previous year's wood. Flower clusters create an endearing effect, especially when viewed from below or through filtered sunlight. Most often used as a rootstock for selected cultivars. 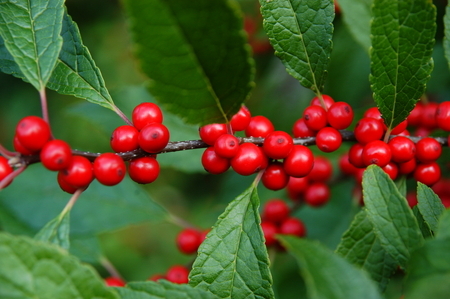 This native American shrub can grow to 20 ft. with equal spread. Prefers moist soils, but full sun in the landscape encourages more compact growth. Trim branches just before the plant blooms to force indoor flowers. 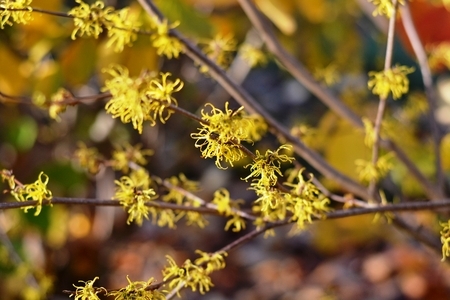 Arnold's Promise has quite fragrant yellow flowers opening after other varieties. 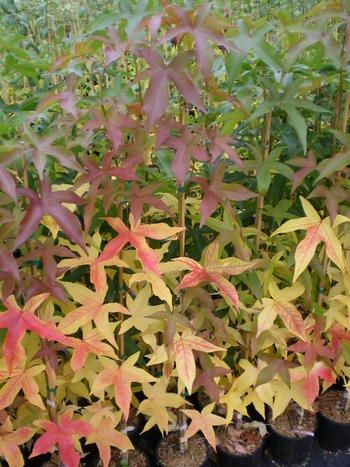 Fall color is a mix of yellow, orange, and red. 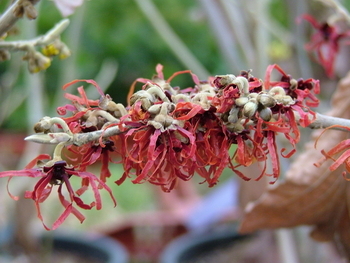 Diane has the reddest flowers of the group, with an infusion of copper. They are faintly fragrant. The fall color ranges from non-existent through gold and red. 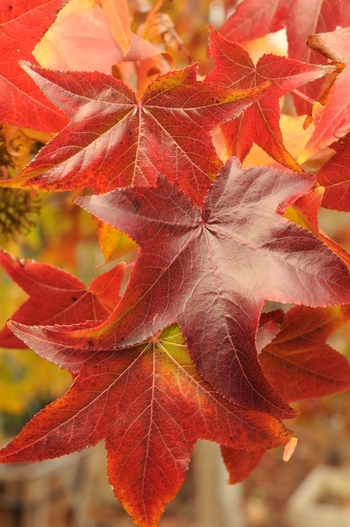 Due to its multi-season appeal, this multi-stemmed tree, introduced from China only in 1980, is finally starting to gain followers. Covered with large clusters of white flowers in mid summer, in late summer and fall it displays great masses of pink-red seeds. Finally, the winter season highlights its shaggy bark - the color of soft beach sand. 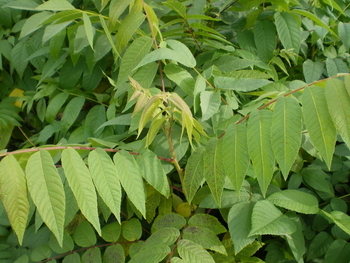 It does require shaping to highlight its normally "stemmy" form - a central leader formed early helps to make it a highly marketable tree, but it cannot be reshaped if neglected when small. Half the size of most other cultivars, this one shares their tough constitution and season-long appeal. 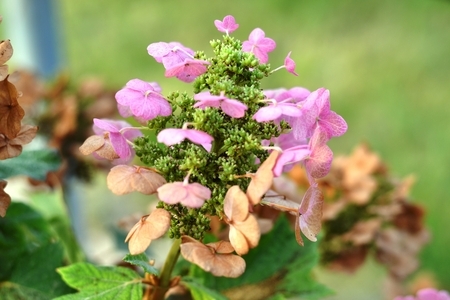 Upright flowers emerge cream-colored and become a surprising wine-red color with age. Very compact, to only 4 ft. tall; an abundantly flowering selection from the US National Arboretum - Dr. Sandy Reed in TN. Flowers held erect, emerging white and aging to an appealing light pink. Extraordinary plant! This is the smallest form that we offer, but it's not a dwarf. It has smaller flowers and redder fall color than the others. Some tip damage below -30°F. Another remarkable release from the U.S. National Arboretum's shrub breeding program in McMinnville, Tenn. in 2013 for which they should be rightly proud. Blooming a week later than other sections and holding its mature inflorescences even longer it really extends the season. The inflorescences are 9 inches long and age to pink while the plant grows to 6 ft. tall by 9 ft. wide. Another USNA introduction - a cross of 'Snow Queen’ and ‘Pee Wee’. The upright, 9 in. 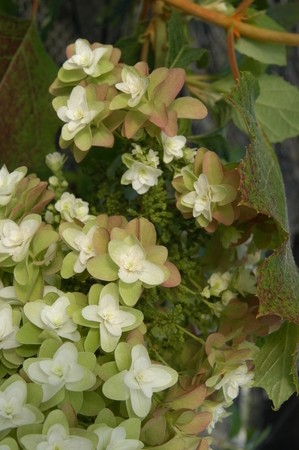 inflorescences come out white but very quickly develop a pleasant rosy hue. To only about 3.5 ft. tall, it fits neatly into today's compact multi-family housing landscapes. Half of normal size, spreading to 4 ft., this clone is well-suited for textural contrast in a perennial border. A prolific bloomer, its stout stems ensure that the flowers don't droop. Although the coarse leaves give it an almost tropical appearance, the autumn leaf colors are a rich mix of red, burnt orange, and green. When the notably persistent foliage drops, the tan/brown exfoliating bark is a pleasing unexpected bonus. 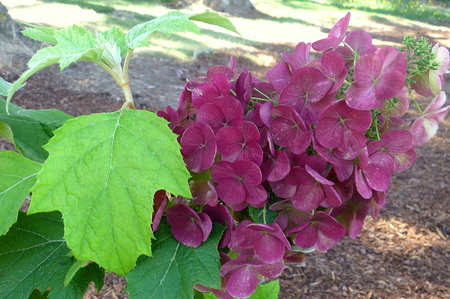 The Oakleaf Hydrangeas share many desirable characteristics: white flowers with bold, trouble-free foliage that turns burgundy red in the fall. Double-flowered 'Snowflake' may have the largest inflorescences, which are usually upright. Prefers light shade. A real dwarf at only 3-4 feet tall! Because of this smaller stature it will work in so many tight spaces that winterberry wouldn't fit into before. It has red fruit. From the European breeding program of Peter Kolster, brought to the USA by Plants Nouveau. Smaller in stature than other selections, 4 feet, it has red fruit. 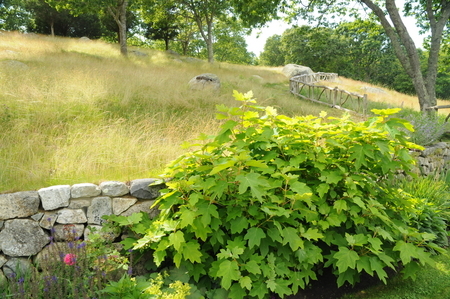 From the European breeding program of Peter Kolster, brought to the USA by Plants Nouveau. 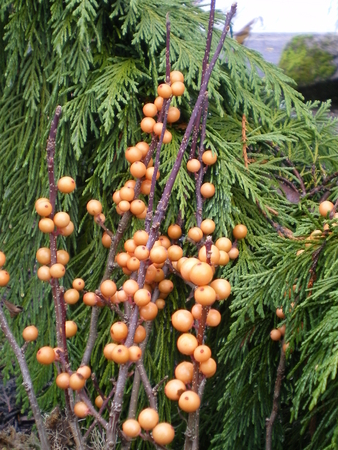 With fruit color that is a major departure from the normal reds these golden hued berries are quite desirable. In our experience they don't set as many berries per stem as standard cut branch varieties but the color alone is enough to make them serviceable for the market. Short, compact form well-suited for cut branch production. Large, dark red berries. Male pollinator: no fruit. Order at least one pollinator for every 10 female plants of fruiting cultivars. Orange-gold fruits and lighter green foliage. Originally found as a branch sport of 'Winter Red'. 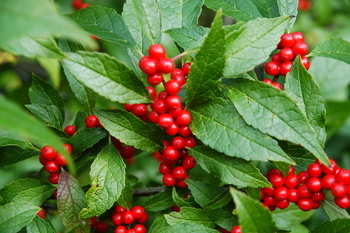 Best known; many say the best winterberry. Selected for the European cut stem market by famed breeder Peter Kolser this is supposed to be smalller in stature. It has red fruit. Smaller in stature than other selections this has orange fruit. From the European breeding program of Peter Kolster, brought to the USA by Plants Nouveau. Everyone's grandma had a walnut table, but the craftsmen who made them are increasingly scarce, and trees of size to cut 16-inch wide boards are too valuable these days to survive much longer on private property unless grandma has her rolling pin handy. Tough, slow-growing American native. 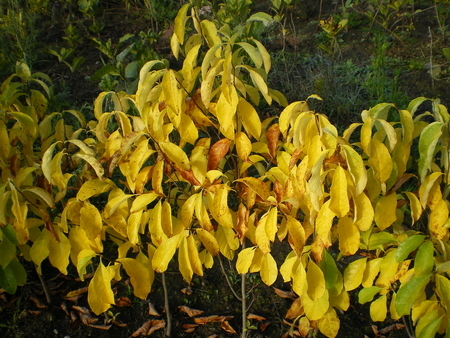 Hardy-source seedlings of the thin-shelled English walnut. Grow on for fruit, or use as a rootstock for improved varieties to sell in regions with bitter cold winters. 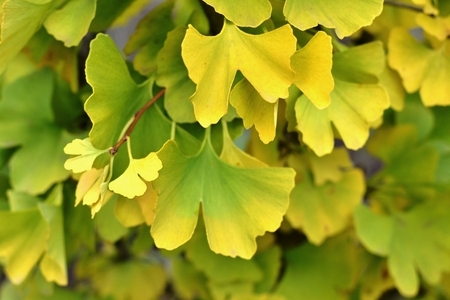 Attractive as a landscape tree for its bright golden summer flowers that stand erect above the distinctive foliage. 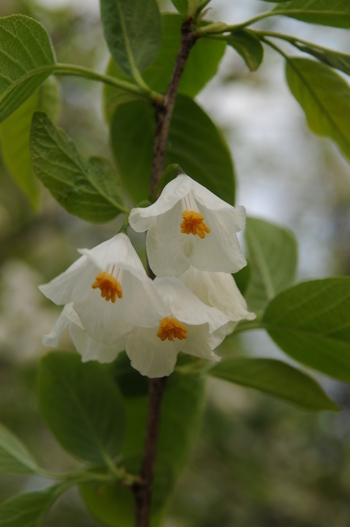 Flowers mature into clustered, papery "Chinese lantern" seed capsules that droop from the branches mid-summer through autumn. 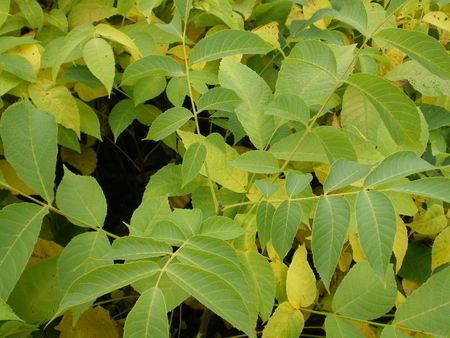 Goldenraintree seems to do best if it is somewhat neglected. Its autumn color, early spring flowers, small habit, ease of care, and fragrant foliage make this shrub highly ornamental. It is well-adapted in wet areas, great for naturalizing, and rarely taller than head-high. Fall color is variable, but striking on some trees. Widely adapted. Shallow roots may cause problems in turf areas or around sidewalks. Unusual, noteworthy tree that grows in a very tight, columnar form, a sort of deciduous version of Italian cypress. Like the species, it is widely adaptable. Good fall color. Among the tallest of our native American hardwoods, it shares much in common with Magnolia acuminata. Intriguing cup-shaped flowers of orange, yellow, and green in early summer. Grows fast if planted in deep, moist soil, but it will languish if planted in a dry or compacted area. Deep purple/red flowers, blooming before 'Betty'. 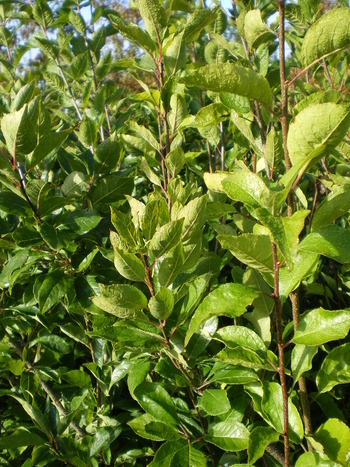 A vigorous, dependable, and easily grown stocky shrub. Flowers purple/red on outside, whitish inside. 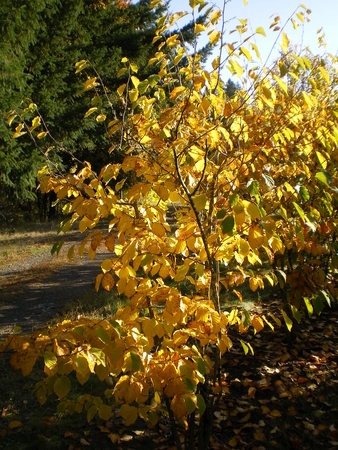 A 12 ft. tall rounded shrub with copper-colored new foliage in spring. Wow! A knock-out new hybrid from the late Dennis Ledvina, a result of his astutely crossing 'Yellow Bird' with 'Caerhays Belle'. 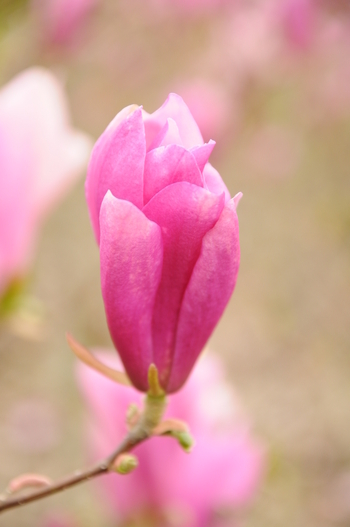 The blooms are strikingly beautiful, aptly named for their soft blush-pink color. An upright, spreading small tree with abundant flowers of pleasing yellow color. 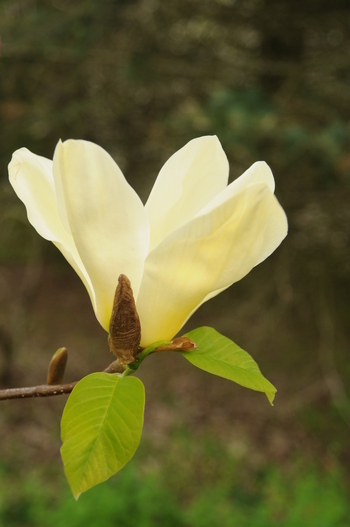 If spring is warm, flowers tend toward a cream color. Cameo is a sister seedling to Cleopatra and is the latest release from the New Zealand Magnolia Grove breeding program of Vance Hooper. A stunning bloom with a sculpted form like a cameo broach. Reddish purple exterior with clean white flushed red-purple interior. Cameo has exceptional flower power, second only to Genie for freeness of flowering. 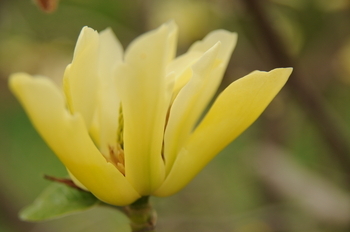 The high rate of flower production both in spring and summer keeps the plant as a small tree with a compact habit. A hybrid of curious parentage, sieboldii x tripetala, found at Kew in the 40's. 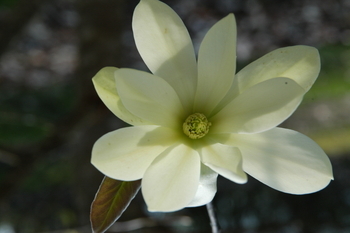 Its upward facing, white flowers of pleasant fragrance are borne in May and June with the large foliage. Its color is a attractive crystalline red-purple that almost has a metallic sheen. The growth habit is an upright small tree with a columnar to pyramidal habit. 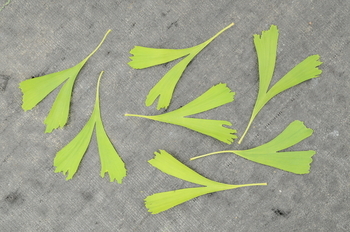 It will produce summer flowers, particularly where summer rains are common. 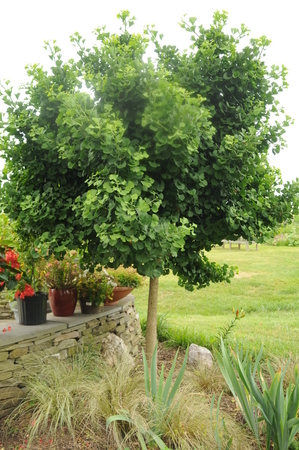 In 2013 'Cleopatra' won first prize for the best new tree at the International Plant Trade Fair in Essen, Germany. 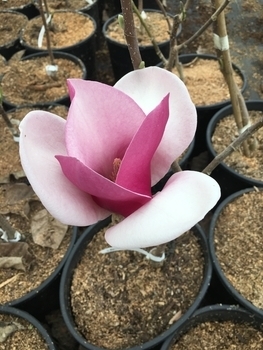 This recognizes the special qualities of 'Cleopatra' and helps put Magnolia Grove, NZ on the world map of Magnolia breeders. It is showing good resistance to mildew. 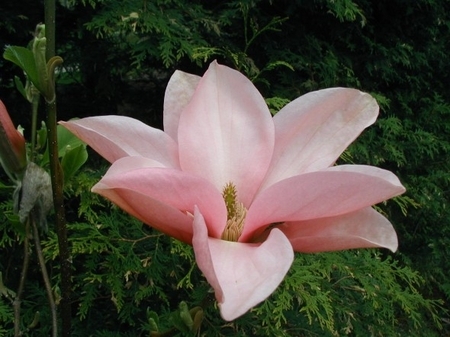 The late August Kehr of Hendersonville, NC considered this his finest magnolia hybrid, and we whole-heartedly agree. 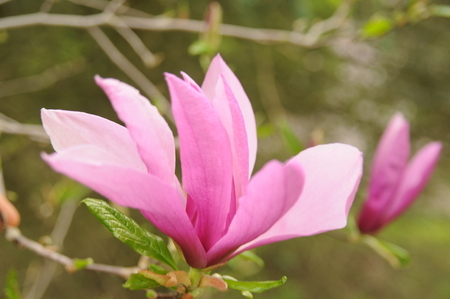 Upright in form, the blooms are delightfully fragrant. It has two significant attributes. First, it blooms much later than M. x soulangiana (6 weeks) so the flowers seldom freeze. 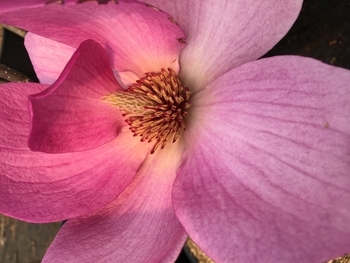 Second, the rich pink flowers have a crisp, translucent character to them that makes a dramatic contrast to the duller pink blooms of M. x soulangiana selections. These plants are quite a prize. Really large flowers, 8 inches plus, exterior of deep purple-pink and a lighter pink interior, open mid-season missing the early frosts. It is supposed to maintain a good leader though we can't be certain of this personally as we've cut our stock so hard to get this into production for you. 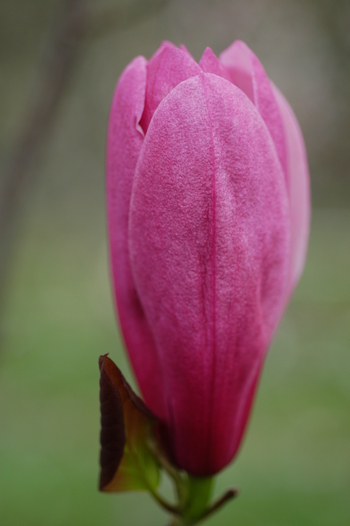 Magnolia liliiflora 'Nigra' and Magnolia sprengeri 'Diva' were crossed to make this handsome early hybrid. Very dark purple buds open to medium purple 8 in. flowers on this hardy upright tree. Consistently praised by our clients as a dependable money-maker for its precocious blooming habit, ease of care, and fast growth in the nursery. The culmination of 15 yrs. of breeding - a compact, small tree maturing at 10-13 ft. tall. 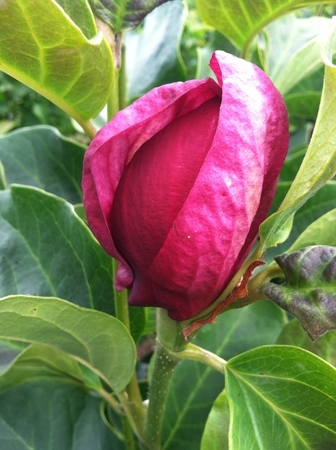 Sensational black-red buds open to small, globular tulip-shaped blooms of deep rich, maroon-purple - both inner and outer surfaces. 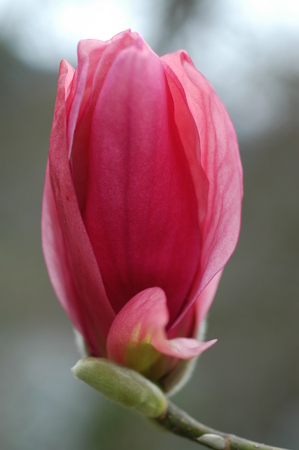 Reflexed tepal tips fade to a lighter magenta-rose. ‘Genie’ has lightly scented blooms. 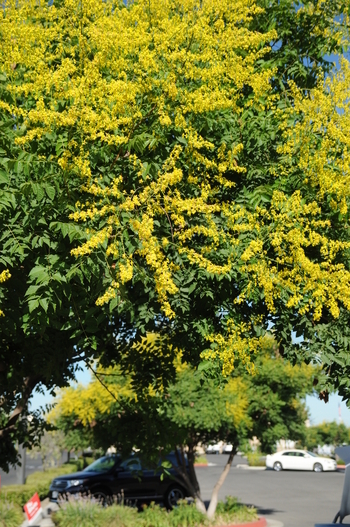 A vigorous tree of uniform, pyramidal habit, having light yellow frost-tolerant flowers. 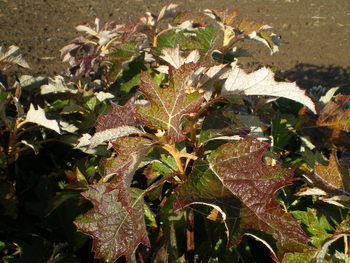 Even without its flowers, it is worth growing for its handsome, bronze new foliage. A choice plant, too-little known and used.